The Anjuna flea market is held each Wednesday (except during Monsoon Season) on the Southern edge of Anjuna beach. This market has multiplied in size over the last few years now including more than 500 stalls. There is a huge variety of different wares including clothes, foods, jewelry, and other varied ornaments and nick knacks. 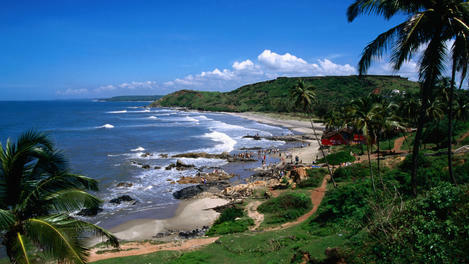 Graced with long stretches of sandy coastline Goa is well known for its beautiful beaches. The beaches are put to a variety of uses from luxury resorts, to small individual huts, and Goa’s international renowned beach trance parties. Each month a famous full moon dance party is held. 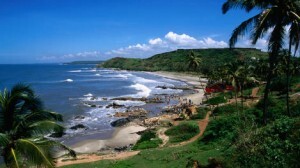 Be sure to try Goa’s different beaches that include Baga, Arambol, and Agonda beaches. Another of Goa’s attractions is a trip to the spice plantations near Ponda. The tropical climate around Goa makes it ideal for growing spices. One of the most acclaimed nearby spice plantations if Savoi Plantation which is reached by a fantastic drive through the jungles and hills of Ponda. It is possible to have organized tours through the plantations and even at some of them to arrange activities such as elephant rides.